With the longer days and warmer temperatures of spring comes the itch to shake winter cabin fever and explore all the events and attractions that we missed so much. Here are some spring happenings to add to your itinerary, from baseball games to a wonder of the world, outdoor festivals and food trucks galore. 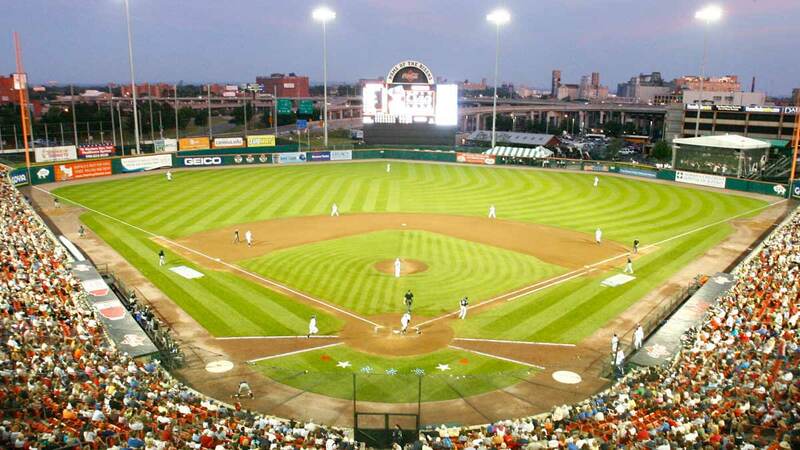 It’s America’s greatest pastime: the Buffalo Bisons return to the old ball game for their 2019 home opener on April 4th, celebrating over three decades at the newly named Sahlen Field. Sunshine, Friday night fireworks, and an expanded ballpark food menu add to the experience. The whole family can enjoy a one-of-a-kind baseball game, with mascots (including a walking stalk of celery), entertainment, quirky competitions and cold beers – with the Conehead guarantee, of course. To the north, the Maid of the Mist crews are getting the boats prepped for the 2019 maiden voyage beneath mighty Niagara Falls. Feel the sheer power of the falls, experience breathtaking views, and get soaked (don’t worry, there are ponchos!). Once you dry off, spend your day exploring over 150 years of Olmsted-designed history at Niagara Falls State Park (and six other Olmsted parks within the City of Buffalo, more info here: www.bfloparks.org). As the park’s gardens begin to pop with color, the areas surrounding the falls become infinitely more beautiful. Speaking of in bloom, the beginning of May ushers in lots of stunning natural beauty. The Cherry Blossom Festival, held annually at the Japanese Gardens of Delaware Park, comes to life on May 4th as Mother Nature paints the trees with pale pinks and whites. With gorgeous backdrops of the History Museum and Mirror Lake, this once a year event is a feast for the senses. There’s even more vibrant and colorful flora to see and sniff as the Buffalo and Erie County Botanical Gardens are in a state of constant change. Their Spring Flower exhibit is on display until April 28th, followed by Arbor Day Tree Tours and the Fairy & Gnome Festival. If you’re looking for a little R&R along with great drinks and food, you can’t go wrong visiting Larkinville in the spring. April heralds the return of the much-loved Food Truck Tuesdays. 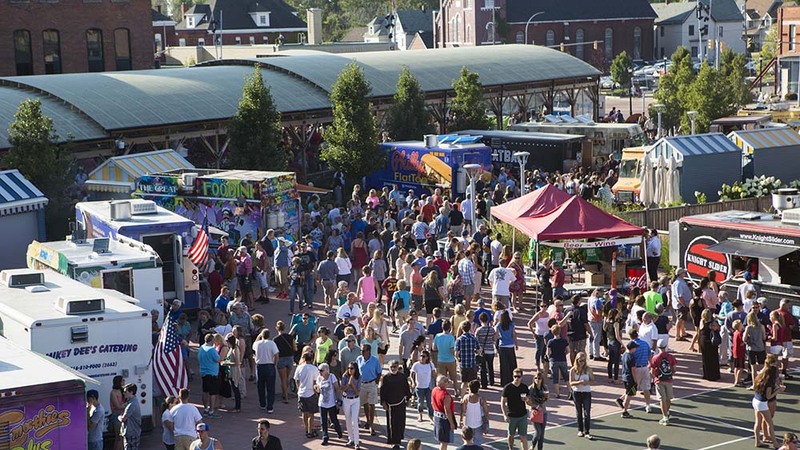 Nearly two dozen local food trucks are stationed in the heart of Larkinville to celebrate warm weather, live music, and of course, food! Once you’ve had your fill, head across the street to Hydraulic Hearth or down Seneca Street to Flying Bison Brewery, Buffalo Distilling or Buffalo Brewing Company to enjoy tasty craft beer and cocktails, and wickedly cool outdoor patios. 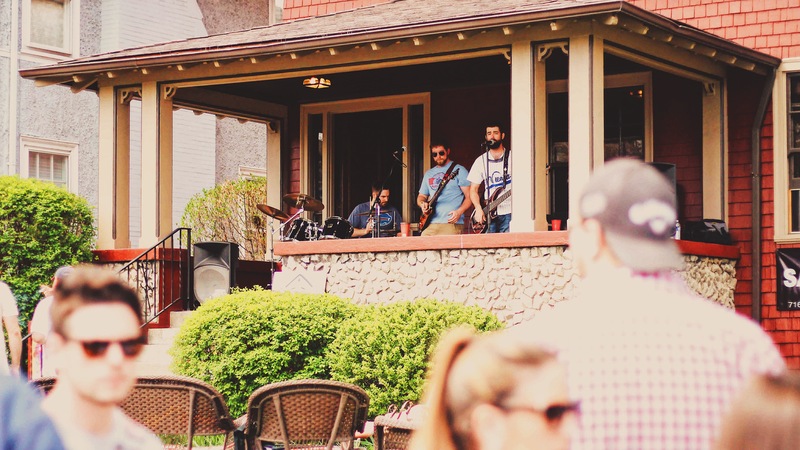 For the music lover, the quaint porches of the Elmwood Village become the stages for local musicians at Porch Fest. This biannual grassroots music festival allows visitors to walk (or Reddy Bike) from porch to porch sampling the music of dozens of artists. Down on the water, the Buffalo & Erie County Naval & Military Park is back on active duty through the summer with tours, events and more. Step aboard three decommissioned military vessels including a Cleveland-class cruiser, destroyer and submarine. 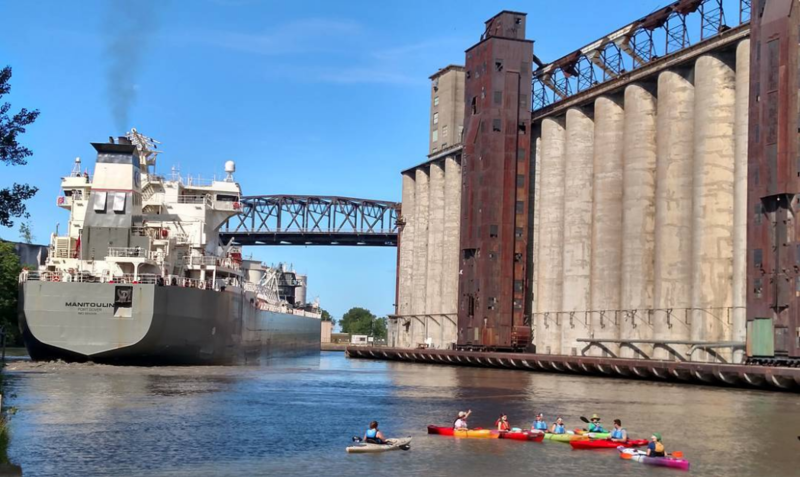 Just a short meander down the Buffalo River will lead you to two festivals taking place amidst Buffalo’s large collection of grain silos. Celebrating the end of winter with music, food and merriment, Thawfest on April 5th is taking place at Buffalo’s waterfront playground at Buffalo RiverWorks while Boom Days is spreading the spring love all around the Old First Ward neighborhood on April 27th. And if while in town, you’re curious about all of the beautiful architecture, make sure you hop on an Explore Buffalo tour. As tours ramp up in April it’s best to book early. Walking, biking, boat and bus tours of the city’s massive grain silos, Gilded Age mansions, and masterworks by architectural greats such as Richardson and Wright highlight Buffalo’s rich history.